Friends meet in silence and in community. We believe that “There is that of God in everyone,” and that it is within the ability of every person to have a direct relationship with the divine. Thus, our Meetings for Worship are held in expectant silence, free of any prearranged form. Our shared experience of worship deepens our listening for guidance from the divine source. At times, Meeting attenders may be moved or led to speak. Hearing another out of this silence allows us to attune closely to the speaker and can provide insight for our own seeking. When more than one person is led to speak, it is traditional to leave a time of silence between speakers. Meeting for Worship lasts about one hour concluding with a joining of hands around the circle and an opportunity for introductions and sharing. Quakers also meet regularly to conduct business. Such a meeting is called a Meeting for Business and is also held in a state of worship and usually takes place once a month after Meeting for Worship. 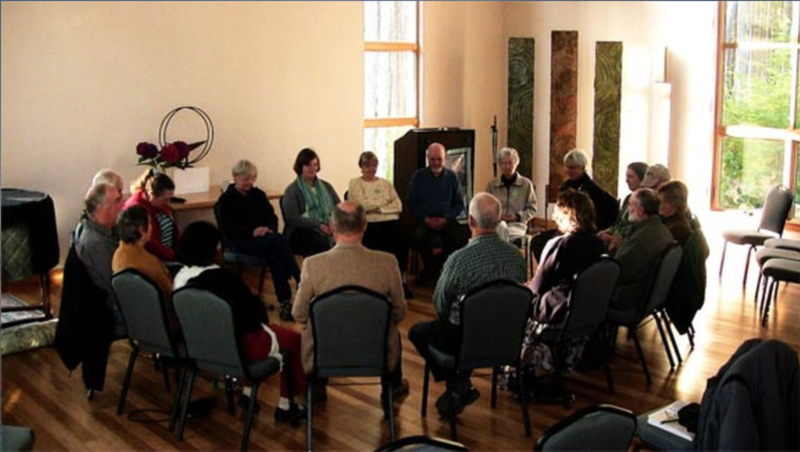 A small group of us began meeting in the Quakerly manner in 1991. We became active in witnessing against the Gulf War and, under the care of Port Townsend Monthly Meeting, formed Whidbey Island Worship Group. In 2012, we became Whidbey Island Friends Monthly Meeting . very Throne of God ; one ray which belongs to each one individually ; which is for that one supreme and apart; the ray which shining from the heavenward side of conscience, and so enlightening and purifying it, must of necessity dominate the whole being."